A fall day in Kanawha State Forest. Just miles from West Virginia’s capital city of Charleston, Kanawha State Forest has more than 25 miles of trails for runners of all levels to explore. Most trails are between 1-2 miles long and the paths are easy to run on. There are several beautiful views, although some of the trails are fairly steep. The trails at Kanawha State Forest range from flat and pretty easy to steep and more difficult, but nothing that a beginner runner can’t handle. Most trails are between 1-2 miles in length. The park is open year-round, but there could be snow in the winter, which can make it slippery for runners without the right treads on their sneakers. 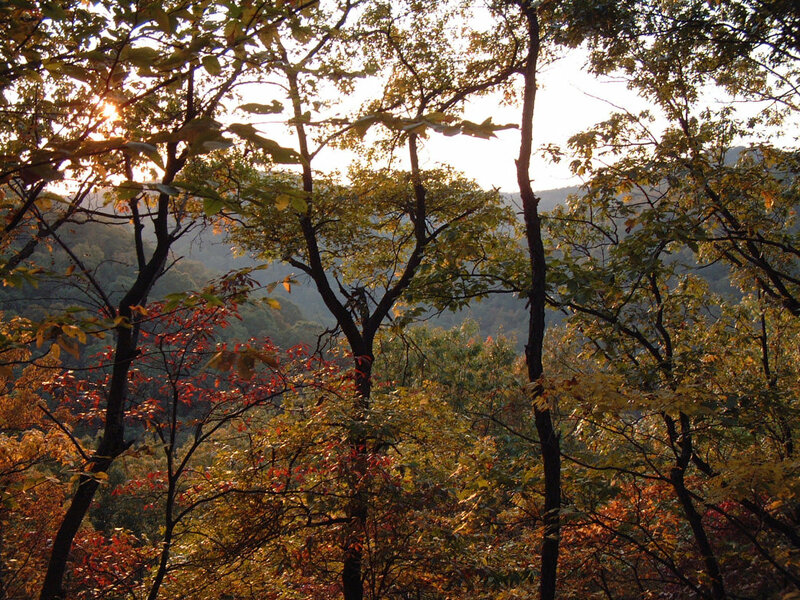 The Kanawha State Forest is one of Charleston’s largest parks with more than 25 miles of trail through scenic, wooded areas. There are 14 trails solely for hikers and runners. Most of the trails are interconnected, and individual sections range from .25 miles to more than 2 miles. Whether you are on a point-to-point or an out-and-back trail, you will find even surfaces and beautiful views throughout. Because the park is so close to the city, you can easily get to the forest for a quick weekend workout or a post-work run with your dog. With so many trail options and terrains, there is something for runners of nearly every experience level. There is a nice variety of trails at Kanawha State Forest. Some are easy/moderate runs with little to no elevation change, some creep along ridgelines and have moderate to steep ascents with overlooks, and others offer a combination of both. Overall, the forest is not particularly physically demanding, and most trails are easy to navigate and less than 2 miles long. Kanawha State Forest is a great place for an afternoon visit if you’re looking for a quick workout or traveling with your family or dog. One of the most popular trails on the grounds is the challenging, 2-mile Rocky Ridge Trail. Beginning at the Shelter no. 5 parking lot, it loosely follows an access road. You will find some moderate to steep climbs on this trail, but the scenic views are worth it! The forest, while only miles from downtown Charleston, is home to dozens of animals, as well as a wide range of tree and flower species. You are almost guaranteed to come across a whitetail deer or at least a squirrel during your run. The trails at Kanawha State Forest are designed mostly for beginners, but even if you have more trail experience, you will still enjoy running here. The park has some camping options, and its wildlife and plants make it a wonderful spot for photographers, hikers, and anyone else who enjoys the outdoors. The park is easy to find at 7500 Kanawha State Forest Drive in Charleston. There is plenty of parking at most trailheads.